Silverstone Circuits Limited is pleased to confirm that, following approval from Formula One Management (FOM), the 2010 FORMULA 1 SANTANDER BRITISH GRAND PRIX (9-11 July) will be staged on Silverstone’s new Arena Grand Prix Circuit*. The majority of Silverstone’s iconic straights and high-speed corners are retained in the Arena Grand Prix Circuit. The only significant change is from Abbey corner where, instead of heading into Farm Straight, Bridge and Priory on the traditional Grand Prix circuit - which remains and will be used for future events, including historic races - the drivers will now turn right at Abbey onto a dramatic new section of track. Turning right at Abbey corner, Button, Hamilton, Schumacher and co. will now race back up towards ‘Becketts’ and into the new ‘Arena Complex’, which has been designed with a view to creating three new overtaking opportunities. The circuit then links up with the ‘National Straight’ before re-joining the original Grand Prix circuit at ‘Brooklands’. Silverstone has invested more than £5 million on this new, super fast circuit, with work scheduled for completion in March, 2010. Away from the track, the Northamptonshire venue is making a number of improvements to its spectator viewing areas. In addition to constructing elevated viewing banks, existing grandstands and fence lines are being moved to bring fans closer to the on-track action. The new track design retains the essence of Silverstone - a fast and flowing, yet technically challenging circuit that the drivers love. Scientific data, based on mathematical simulations and interpolations provided by Populous, the world’s leading sports architecture firm who have consulted with drivers and riders to design the new circuit, has calculated that Silverstone will continue to be one of the quickest circuits on the F1 calendar. Despite the circuit length being increased by 760m, lap times for an F1 car will only be increased by four seconds. 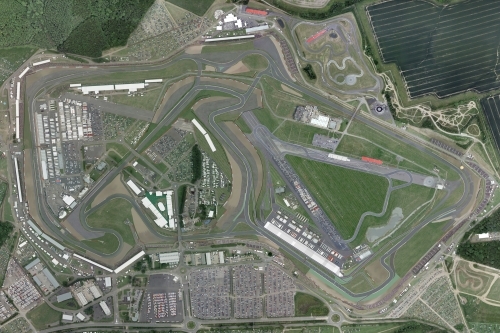 MotoGP (18-20 June) and World Superbikes (30 July – 01 August) are also heading to Silverstone in 2010, with both events scheduled to take place on the new Arena Grand Prix circuit. While the first major international race meeting to run on the Arena Grand Prix Circuit will be the Silverstone Supercar, featuring the FIA GT Championships on 1-2 May. Richard Phillips, Managing Director of Silverstone Circuits Limited, commented: “The new sections of circuit were initially brought in to comply with MotoGP safety regulations, but the ‘Arena Complex’ was always designed with both two and four-wheeled racing in mind. We have been very careful, working closely with drivers and riders, to make sure we are improving and enhancing what Silverstone already has to offer – from a drivers, riders and spectators point of view. Work on Silverstone’s new Pit and Paddock Complex, to be located between Club and Abbey, is scheduled to be carried out between the spring of 2010 and the summer of 2011. Included in the complex will be new garages, a race control building, media centre, hospitality and VIP spectator zones and a primary paddock. Tickets for the 2010 FORMULA 1 SANTANDER BRITISH GRAND PRIX are now on sale. Tickets can be booked 24 hours a day, seven days a week at www.silverstone.co.uk, or by calling 0844 3728 300*. * Subject to FIA homologation ** The location of several grandstands will have changed for the 2010 FORMULA 1 BRITISH GRAND PRIX. Customers are advised to clarify grandstand positions, prior to purchasing their tickets.